The Learning Technologies Team in the Library won the Blackboard Catalyst Award for Community Engagement for their work developing Minerva, the new combined virtual learning environment (VLE) and portal. Founded in 2005 by education technology provider Blackboard Inc., the Blackboard Catalyst Awards recognise and honour innovation and excellence in the Blackboard global community of practice. This community centres on educators and administrators who are passionate about using technology in education and collaborating on best practice. Minerva, the University's new Portal and VLE, was launched in July 2017. Paul Cave, an e-Learning Officer involved in the Minerva project, describes the community engagement work with users to make a system that met user needs. "We reached out to students and staff during the project to find out what they wanted from an online portal. We spoke to a wide range of users across all user groups, using both quantitative methods, such as online surveys and group workshops, and qualitative methods, such as one-to-one sessions. We also consulted staff users to find out the needs of the different departments so we could balance that with the needs of our students." "One of the main things we found out was that people wanted to avoid information overload and not be bombarded with lots of different choices and messages. This led us to create just three tabs, bringing together the core things that students wanted from the previous portal, to streamline the interface so it works better for users. The "Home" tab displays key communications from modules, schools and departments and the University. The "Learn" tab brings together a raft of different systems to access online module areas, reading lists, past exam papers and other activities directly relating to study. Then we made a user driven help point in the "Discover" tab, with links to important information and services from across the University along with an intelligent search function. We also put a lot of work into making Minerva mobile-friendly!" "This is a unique approach and community engagement was crucial to the successful design and implementation of Minerva. It's a very innovative use of Blackboard to develop a portal and bring it together with the VLE to provide a single place for students to receive communications, undertake their studies and look for help and information. We’re one of only a handful of institutions to do something like this and the feedback we’ve had from our users has been overwhelmingly positive. That said, we’re not complacent – we’re continuing to talk to staff and students so we can make the Minerva experience even better in the future." The Library’s Learning Technologies Team are responsible for the support and development of a number of institutional learning technology services, including Minerva. They support the University’s Blended Learning and Digital Student Experience strategies across campus and within the Library. 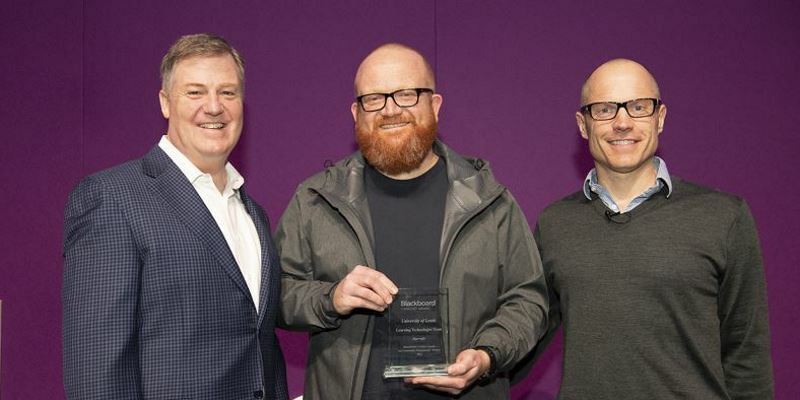 The photograph shows Stuart Robinson, eLearning Officer, receiving the award on behalf of the Learning Technologies Team, from Blackboard representatives.